← A method to chose your workplace pension scheme. Can social media play a part in pension scheme governance? One of the requirements of the NAPF’s Pension Quality Mark is that for workplace pension schemes to meet the mark they must show some level of governance. PQM requires that SMEs (and micro employers) manage their workplace scheme.. The PQM is aimed at companies both large and small and the latter may not have the resources available to run a permanent management committee. However, in applying for the PQM, the company will have to show that, as a minimum, an annual scheme review is adequately carried out. But what happens at “an annual scheme review”? In my experience, these meetings are unfocused as there is little that a small employer can do to influence the behaviour of the master trust or insurer of which they are but a miniscule participating employer. In practice, after a couple of years, these meetings take place so that the PQM mark is retained , there is little ambition left to exercise pressure on the pension provider and over time the process falls into disrpute. Looking at it the other way round, if you were at Aviva or Legal & General or Standard Life, would you be managing your strategy around the requests of your SMEs and micros? Well you might if they acted together and exerted pressure collectively, but we know that organising small employers is as difficult as organising small shareholders. There is no collective voice. to enable employers to identify the multi-employer schemes that have good governance, low charges and clear member communications. ‘Pension Quality Mark READY’ will also help multi-employer pension schemes to demonstrate they meet an independent benchmark of good quality, and will help drive up standards in the pensions industry. Good stuff, but that still leaves most employers (who use contract based arrangements) with little guidance as to what makes for good. And it does not solve a more fundamental question as to how the management committee exerts any control over the behaviour of the provider either of the master trust or contract-based services. John Lawson of Aviva, worries about the lack of effective controls on a master trust board and he’s right to do so. A master trust can be set up by anyone for anyone with anyone being a trustee. John argues that for a master trust to offer itself as a workplace pension scheme, it should have a supervisory trustee from the Pension Regulator on its Board. But we have tried “supervision” of pensions in this way before. Direct regulation of pension schemes through Government participation in trustee boards will do little but bureaucratise one of the most innovative and healthy parts of workplace pensions. The alternative to “super” vision is “sub” vision or “bottom-up governance”. Traditionally occupational schemes (and master trusts are occupational schemes) have been influenced by the views of member nominated trustees and well established mastertrusts like the Social Housing Pension Scheme have real representation on the trustee board from MNTs. But we are talking here of models that grew up in the 60s and 70s. Are the systems used to offer participating employers a say in the running of mastertrusts or contract based workplace pensions fit for today’s purpose? I would argue “no”. The world has moved on- not just the pensions world either. Whereas in the past MNTs were supplied by unions, today many employers are non-unionised. Nowadays. Nowadays, if a group of employees need something to be done, they organise a Facebook page and get a campaign going. If a group of employees want something done, they can congregate using a Linkedin Group or a Google Page. I was speaking with Paul Bucksey of BlackRock about this yesterday and he made a very good point. Where social media is likely to be important in pensions, is where employees and employers start organising themselves to put pressure on the providers of their pensions to come up with the goods. I’ve spoken about people power in pensions and heartily agree with Paul. It is only a matter of time before the pressure among those now relying on these new DC workplace pensions builds to a point that there is organic organisation among users to collectively exert Governance. The PQM, if it is smart, could tap into this latent pressure and do its bit to create the structures for these groups to develop. It may be that there is nothing it need do but facilitate the growth of these social media groups. However, I suspect that leaders will emerge from the pack who will take “sub-vision” through social media forward, independently. The PQM, who do understand social media, may find their role not as instigators of change but facilitators of proper change. The proof of the pudding will be in the eating, but don’t be surprised if in five years, the most important influence on the management of DC workplace pensions, whether under a master trust or contract, comes from social media groups organised by the people for the people. Social media is the new voice for the small company and the disconnected employee. In my view it will become the means that their voices are heard by the pension behemoths. This entry was posted in auto-enrolment, corporate governance, dc pensions, Facebook, Linkedin, social media, twitter and tagged Aviva, BlackRock, Legal & General, pension, PQM, Small and medium enterprises, social media, Standard Life. Bookmark the permalink. 15 Responses to Can social media play a part in pension scheme governance? A number of larger firms are using Enterprise social media to support internal communications and collaborative working. 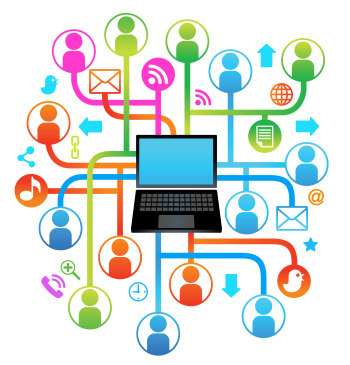 In our consultancy business we use Yammer as a quick and easy way to update, nudge and share. Like wealth managers and DFMs, there is a need in this market for strong content management and the ability to (mass) customise and we see the way forwards on this in the next generation of widget or app-based portal solutions which can interact with underlying systems – pension/flex/personnel and payroll – but not be encumbered by a poor user interface and silos of information..
Auto enrolment is a huge discontinuity in the pensions environment. We’re going to see the number of employers offering workplace pensions increase by an order of magnitude. That’s a big change in any environment. Social media will play a part in the new world- and I’ll sound like a stuck record if I refer you back to my response to the Everybody Needs Standards post. I like Vaughan Jenkins’ approach, but it’s addressing a slightly different need – that of member communications. I read Henry’s blog to be more about getting providers to listen and respond more creatively to governance requirements. The internet has changed our relationships with other professionals in our lives. For example, how many people have at least googled their ailment before proceeding with treatment? With a massively increased customer base created by the new environment there is a real opportunity for providers to use their significant development capabilities to develop open access to relevant information for all parties in the equation – employers, advisers and members. All parties will be able to use this improved transparency to assess the value or otherwise of the proposition . This is ‘A Good Thing’. But let’s be clear; open access governance means all parties will contribute and be assessed by the others. Providers have sometimes been the distant and undefended whipping boy for some advisers and employers. In this new world don’t forget that transparency means you’ll be able see both ways.